PakarBedahAnda or Your-General-Surgeon is my blog in which I highlight common surgical problems faced by Malaysians. In the last 20 years of my practice, many of my patients presented with advanced diseases in which treatments were more complicated, and if they were cancers then the prognosis were poor. This is also my personal 'fight' against late presentation of surgical diseases particularly cancers. Lama sungguh saya tak menulis di blog ini.... Sebenarnya saya 'dah lupa' pasal blog ini - maklumlah zaman twitter dan facebook sekarang ini. Sehinggalah saya dikejutkan beberapa email yang menanyakan tentang beberapa perkara yang saya tulis dalam blog ini. Begitu jugalah dengan beberapa kes yang really 'mencabar' ego yang InsyaAllah akan saya nukilkan dalam beberapa penulisan yang akan datang. Kes-kes ini menuntut saya terus menulis - orang Malaysia masih tak faham penyakit kanser. Sometimes, when you see something. you just could not forget it . . .
Way back during the earlier years of my career, there was a little girl admitted to my ward with intestinal obstruction. She was found to have multiple polyps in the small and large intestines. She was operated and got well. While in the hospital (biasalah - university hospital - batches of medical students came to see her because she had distinctive pigmentations on her lips - malangnya her father who also had the same pigmentations listened to the medical students' discussion. Dia rasa bersalah kerana menurunkan baka penyakit itu kepada anaknya. Apa yang medical students tu cakap tak tahulah... hinggakan satu pagi dia dijumpai mati setelah terjun bangunan hospital lapan tingkat. Commit suicide ! So, when this man came to me with abdominal pain, I knew the diagnosis straight away... because of the distinctive lip pigmentations. The dots or circum-oral pigmentations on the lip, or freckling of the mouth is a feature of a hereditary condition call Peutz-Jegher Syndrome. I knew straight away that the abdominal pain was most probably due to intestinal polyps. X-ray showed feature of small intestinal obstruction. I took him to the operation room, and this was what I found ! Peutz-Jeghers syndrome (PJS) is an inherited condition that puts people at an increased risk for developing hamartomatous polyps in the digestive tract, as well as breast, colorectal, and other types of cancer. 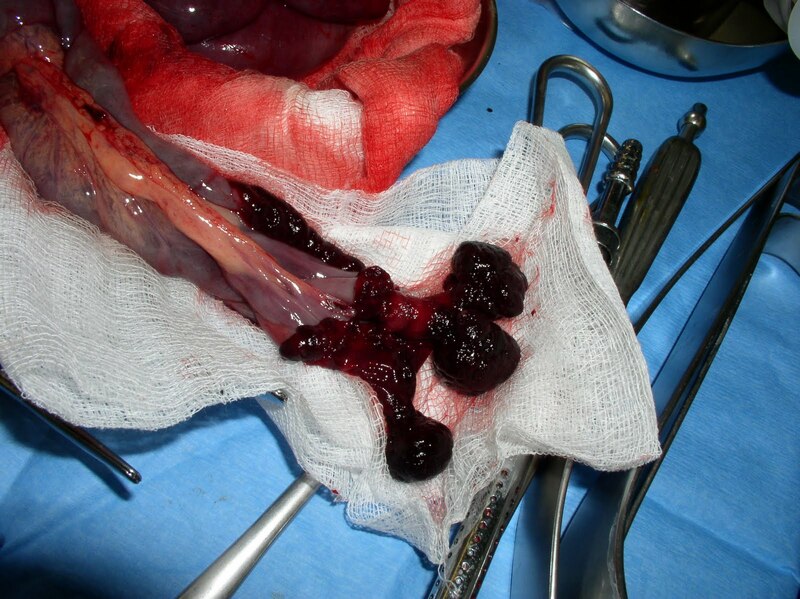 A hamartoma is a growth of normal-appearing tissue that builds up into a non-cancerous tumor. 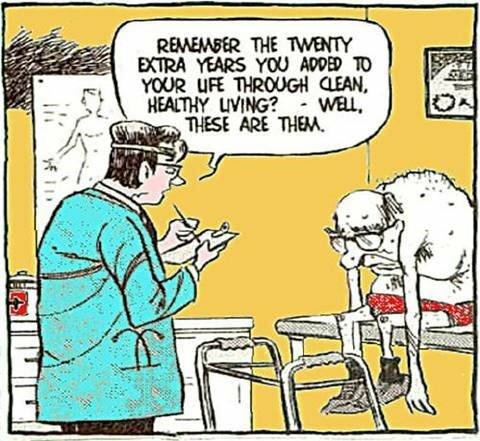 However, the growth can transform into cancer over time. Cancer begins when normal cells begin to change and grow uncontrollably, forming a mass called a tumor. A tumor can be benign (non-cancerous) or malignant (cancerous, meaning it can spread to other parts of the body). The lifetime risk of cancer in people with PJS is around 93%. People with PJS also tend to develop dark blue or dark brown freckling, especially around the mouth and on the lips, fingers, or toes. Freckles generally appear in childhood and may fade with age. Apa maksudnya semua ini bagi pesakit tersebut? Ini bermaksud kemungkinan beliau untuk mendapat kanser (terutamanya kanser usus adalah tinggi) dan beliau mestilah menjalani satu skima pemeriksaan perubatan secara berkala untuk mengesan kanser sebelum ianya parah. Bagi pesakit ini, beliau perlu menjalani pemeriksaan kolonoskopi dan ultrasound setiap 2 tahun. Tak semua yang ganjil di kulit kita itu tanda lahir, ada antaranya tanda-tanda kanser. Bertanyalah pada yang tahu. Setiap yang Allah jadikan itu ada sebabnya ! Take a break . . . . .this is not about cancer ! A 30 year old man was rushed to the hospital with a chest injury. He was swimming in the sea near Perhentian Island at about 9.30 pm one night. Suddenly he was hit on the chest by a sharp object; and he found a long 'ikan todak' stuck to his chest. He was rushed to a nearby district hospital where he was noted to have pneumothorax (paru-paru bocor) and a chest tube was inserted. He was then transferred to me for further management. In this era of digital technology, the culprit was easily captured; of course, on camera. This is it . . . . .
As their name suggests, needlefish are long, narrow and silvery. The smaller common species reach about 15 inches long; the larger ones can grow to more than 3 feet. In all species, the fishes' needlelike beaks, filled with sharp teeth, merge with their bodies to form sleek, living spears. 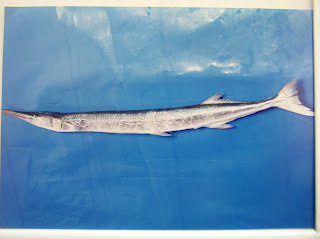 Needlefish have two long jaws, good for catching fish. A needlefish strikes at passing prey with a sideways movement of the head, then swallows it whole. Like their other close relatives, the flyingfish (malolo), needlefish can leap from the water at up to 38 miles an hour, skimming the surface before falling back to the water. This is where needlefish and people can clash. At night, lights sometimes attract and excite these fish, causing them to jump at speed. Needlefish beaks have penetrated the wooden hulls of outrigger canoes. Tragically, one also penetrated the eye of a 10-year-old Kauai boy while he was night fishing in a small boat with his father. The fish beak penetrated the boy's brain, killing him. In other parts of the Pacific, needlefish have punctured people in the chest, abdomen, arms, legs, head and neck. People at greatest risk of needlefish punctures are night reef fishermen carrying lights in low boats. For many village fishermen in the Pacific, needlefish are a greater occupational hazard than sharks. Although it's rare, swimmers and divers have been seriously injured by needlefish in Japan, New Zealand and the Red Sea. No such injuries have been reported in Hawaii, but it's a possibility. To prevent such an incident, night divers should leave lights off until well submerged. Fishermen in small boats should be aware of the potential danger of carrying lights at night. Millions of people, including me, have snorkeled near, dived around and paddled into schools of needlefish countless times without any trouble at all. These lovely, interesting fish aren't out to get you and injuries are indeed rare. Still, it's good to know the facts. Now, when someone asks me if those skinny, silvery fish can hurt you, I won't say never. I'll say, almost never. Jadi, sekiranya anda atau seseorang dilanggar todak, ia bukanlah satu serangan tapi satu kemalangan. Jika sekiranya anda atau seseorang dilanggar kereta, ia bukanlah satu kemalangan tapi satu kecelakaan.
. . . . . fikir fikirkanlah ! 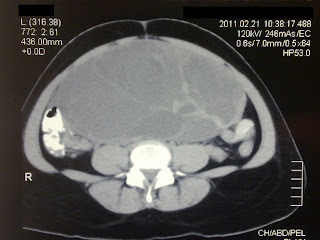 A 30 year old teacher presented with a progressive abdominal distension. It was painless, thus she waited until she could not hide it anymore in her loose outfit (jubah). She just smiled broadly when her colleagues tegur; anak keberapa tu? knowing very well that she was not pregnant. She came to the gynecologist. This is one of the CT-scan pictures: large ovarian cyst with features of cancer. 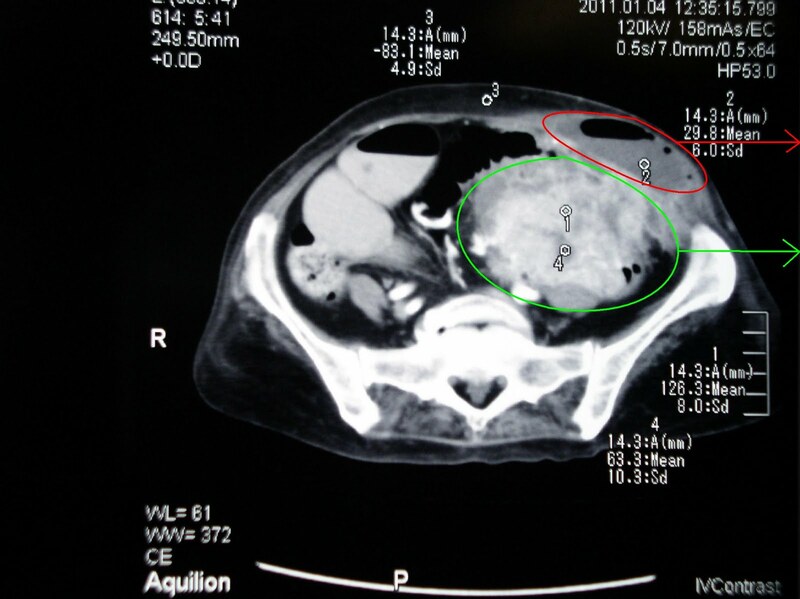 This is the removed specimen; well encapsulated tumour but with features of cancer on CT - Oophrectomy (removal of the ovary) was done by the gynae. I came in the clear the omentum and the appendix; the organs that are usually affected by cancer seedlings. And now she is waiting for her chemotherapy. Kalaulah dia datang lebih awal . . . . .malangnya kalau, kalau, . . . . . . . . . . . .kalau ! Mungkin ini dah jadi budaya kita? Dalam seminggu dua ni kita dikejutkankan dengan beberapa berita kematian. Mula dengan kematian seorang bekas pemain bolasepak, kemudian seorang VIP. Inilah bahana yang melanda anak negeriku..
Ironinya di kampung saya (sebelah Hospital USM) ramai penduduknya dapat manafaat dari kanser. Apa tidaknya, oghe luar (orang dari luar Kelantan) sewa rumah/bilik ketika datang rawatan kemoterapi atau radioterapi di HUSM. Unit Onkologi HUSM adalah salah satu pusat rujukan rawatan kanser negara. Homestay tumbuh macam cendawan di sekeliling HUSM, disewa oleh keluarga pesakit kanser. Kita ada macam-macam kemudahan, tapi kita tak caro nak guno. Betul jugak ....... inilah ironinya kehidupan ! A 64 year old lady presented to the hospital with severe abdominal pain and high fever after balik berurut with a bomoh. She has been visiting this bomoh for a left sided abdominal mass since 6 months ago. According to her children, the mass was initially small in size but lately has grown much bigger. She had been adviced to seek treatment in hospital which she boldly refused. When I saw her, she was in severe pain with signs of septicemia. 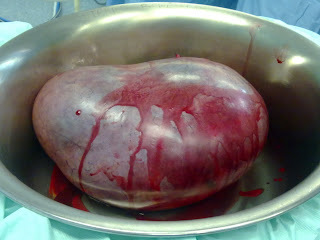 There was a huge abscess (bisul yang nak pecah) in the abdomen with an underlying tumour. Apa yang telah berlaku ? Basically she has a neglected / untreated colonic cancer, now it has perforated through the abdominal wall (kena uli tok bomoh sampai pecah) . Soon, it would be coming out through the skin (itu pun if she survives the septicemia). What needs to be done is to drain the abscess and feces through the skin and treat the infection. Once her condition improves, go and remove the cancer. But that was not in her mind. She wanted to go back to the bomoh. What could I do?. Furthermore she had the full support of her children. So be it. This is it ........ CANCER and Kelantanese don't click ! I hope this is not the end of my struggle. I believe there are many more non-Kelantanese that would benefit from my writings. I am a general surgeon practising in a private hospital in Kota Bharu. Previously I was a senior lecturer in the Department of Surgery, Universiti Sains Malaysia, Kubang Kerian Kelantan. My interest is in colorectal diseases especially colorectal cancers. You can communicate with me by putting up a comment into this blog or directly emailing me at zahari@perdana.kpjhealth.com.my. I will respond to your enquiry as a posting in this blog or directly to you. However my answers will be general in nature. Proper medical advices (consultations) need proper diagnosis - clinical examination, laboratory, radiological investigations etc. 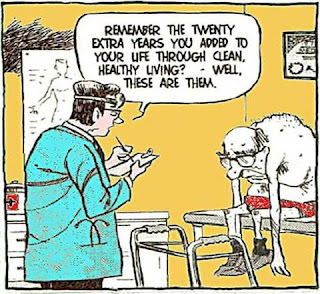 You are adviced to consult your surgeon.